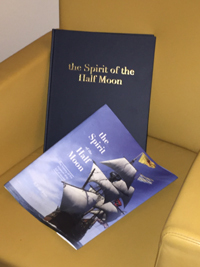 We celebrate the 25th anniversary of the launch of the Half Moon and commemorate & honor all the friends and crew that made it possible by publishing this gorgeous, beautifully illustrated, collector's book: the Spirit of the Half Moon. Our truest replica ship forged her own maritime history. It is therefore time that our ship, full of stories, also becomes part of the continuum of history that began in 1609. YOU are part of this continuum, just as Henry Hudson, Robert Juet and Dirk van Oss were. 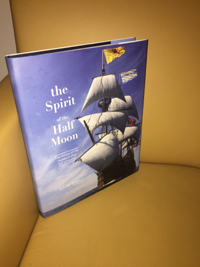 And therefore, just like them, YOU are mentioned by name in this book that begins and ends with the never before published history of the original ship together with the never before published account of the replica ship, its captains and bosuns, crew and various, sometimes unbelievable adventures. Printed in the Netherlands, the books will soon be available in the USA in time for the Holiday Gift Season. To reward you for your patience and participating in the advance sale, you will get an extraordinary good chance of winning a fully paid trip to visit the ship in Holland. Copyright © 2016 New Netherland Museum. All Rights Reserved.